Have you ever heard of a quilt being stolen? Even typing that in gives me the willies and makes me sad. It’s not something that we like to talk about or hear about. And not just from the quilt store. Most often they are stolen from bathrooms (you know those super cute little quilts that decorate the walls), quilt shows (this is done A LOT! ), stores, display booths, from the mail…..and it goes on. Quilts are really admired by everyone and when there is an opportunity to take one- it usually happens. I’m thinking for the most part it might be out of love. The person who is doing the taking simply L O V E S the quilt enough to risk everything for ownership. Because we are such a tight stitch family- us quilters, it’s not easy for the goods to be sold again without someone finding out. We are very possessive and protective of our quilts and projects and we are always on the look out. Whatever the reason- it happens. It’s sad when it happens. A lot of times, they aren’t found. So, today let’s help each other out by finding ways you can give a little added protection to the quilt. You don’t want to be the one getting the news that your quilt is gone. Label the quilt– sounds so simple, but if you took a little bit of extra time to write or print on a piece of fabric and then stitch it on the quilt, that will help. Give info on it that would help it get returned if it was taken. Like -name, state. When you attach your label try to get the stitching super secure. Don’t make it easy to remove. If you can – place it on the back before it is machine quilted. Then it will be tacked down by a lot of stitches and not just the outside border. 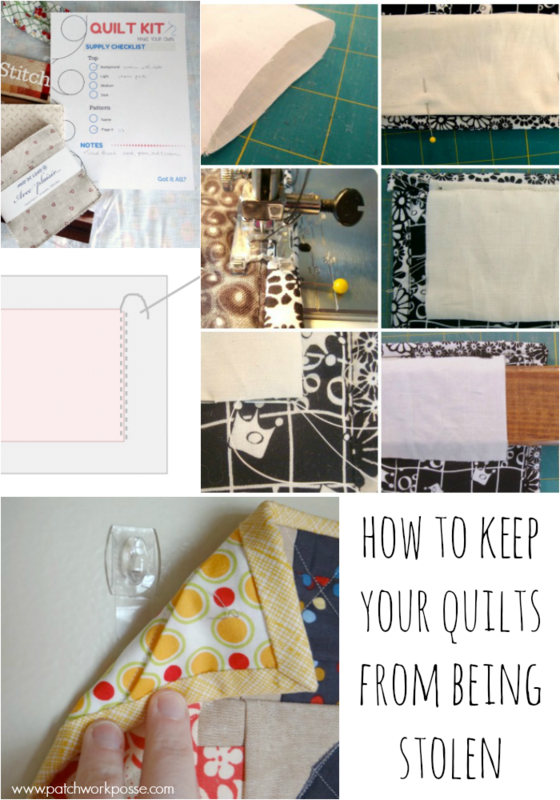 Use quilt hangers or tubes on the back of the quilt so it can’t just be lifted off the hanger and folded up. Add additional safety pins on the hanger tubes to secure, and not make it easy to slide right off. Documentation– take pictures. Make notes. Keep a quilt or project journal (this one is coming soon!) When you are missing a quilt you can easily look up the details to help with description, size, pattern. Have pictures- and even little details that wouldn’t be known to anyone but you the stitcher. This will help identifying the quilt itself as well as provide info that you are truly the owner. Those are the ones that come off the top of my head. I wonder if there was a ribbon you could stitch to the quilt and then pin it to the hanging bar…or something like that manner that would work? If you have lost a quilt- what to do now? Reach out to your own connections and let them know – have your friends help spread the word. Here are a couple of places you can check on for lost quilts as well. It’s so nice to see others that help get the quilts back to their owners. I’m thinking there might a few others that you’ve heard of or used that have worked—- what are they? Leave a comment and let us know about it. That’s awful, that we have to think about that, but it happens. I’m wondering if there is some type of security system, like they use in clothing in shops. They do make them that set off an alarm and not having a paint packet that would go off if removed incorrectly. But even those can be removed with a tool. There are also small GPS chips with batteries that could be installed behind the label and have an app to track it from your phone. At least the police would know where to find it. Technology has come so far that this shouldn’t be an issue anymore. These things might not have been created for quilt shows but could be used or adapted for this reason. Does anyone think the thief may also try to sell the quilt on etsy or ebay. It really surprises me that more quilt shows don’t employ magnetic tamper alarms. One magnet is attached to the back of the quilt with a safety pin and another magnet is attached to the display rod (usually screwed into the rod.) If the quilt is moved and the magnets come apart an alarm sounds. They run under $5 each. I usually bring my own and insist they use it … I put on after judging, of course. What a very sad thought and one I that had not occurred to me! I think a hidden label would be a great idea, especially if it’s quilted in! Just an untried idea here, but what about sewing an extra name label inside the quilt, say under the back right corner under the binding. That way a few ripped out stitches would show hidden proof of ownership were it to be in question. That’s a great idea actually– no one would know where it was so it would be only something for the owner to know. thanks for sharing that! For quilts going to shows, you could put a GPS tracker in the binding. That would make it easy to put in and out if you wanted. Writing your name, with pigman pen ink under the binding so it is hidden, or under the label, but can be revealed if you need to prove it is yours. I have been quilting my name with the machine. It blends with the quilting, but I know it is there.